The relatively new association for the promotion and development of fastening systems, reinforcement, and façade engineering (Verein zur Förderung und Entwicklung der Befestigungs-, Bewehrungs- und Fassadentechnik e. V.) – VBBF for short – has once again conducted a seminar for a broad professional audience. The event addressed itself to users who want to inform themselves further in construction methods using cast-in fastenings, transport anchor systems, reinforcement systems, and façade anchorage fastening techniques. Since the VBBF sees its tasks, apart from the information work solidly grounded in theory and practice on the innovations and technical possibilities of reinforcement engineering – also in its active participation in the European standardization process – the current status of European harmonization and the reform of the associated existing standards represented the first section of the seminar. The Managing Director of the VBBF, Dr.-Ing. Thomas Sippel, and Dr.-Ing. Frank Fingerloos of the German Society for Concrete and Construction Technology (Deutscher Beton- und Bautechnik- Verein) as well as Dipl.-Ing. 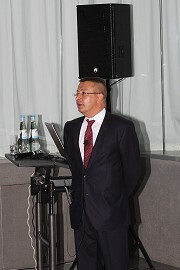 Georg Feistel of the German approval body for construction products and types of construction (Deutsches Institut für Bautechnik), (DIbt), both from Berlin, were among the speakers. Feistel heads the testing and inspection body (Bautechnisches Prüfungsamt) in Berlin, and Fingerloos is a publicly appointed and certified expert for concrete and reinforced concrete construction for the Berlin Chamber of Commerce. He is regarded as the authoritative Germany representative in the European committees engaged in drafting Eurocode 2. Georg Feist’s lively lecture about details of the Eurocode standard and its concrete significance for reinforcement engineering, delivered entirely without notes, was accordingly well informed and comprehensive. Feistel was followed by a practitioner who described the bureaucratic consequences of the new regulations in the day-to-day planning activities of an engineer. The next speaker was Prof. Josef Hegger, another prominent figure involved in the creation of Eurocode 2. Hegger began his lecture by drawing attention to the enormous conceptual depth of the old and no longer valid DIN 5110 standard. He stated that its creation more than 30 years ago was, first of all, possible only because at that time the associations had assigned personnel explicitly for the creation and review of this standard – something that today, for Eurocode 2, is no longer the case. Today, he and his colleague Prof. Konrad Zilch from Munich, shoulder this task in a honorary capacity. This, of course, goes to the expense of the level and quality of the final results. After that Zilch and a co-worker from his Aachen consulting firm Hegger + Partner, Dr.-Ing. 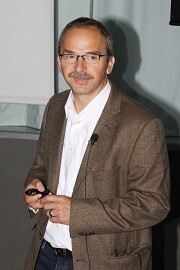 Wolfgang Roeser, focused primarily on problems arising in connection with the design of in-situ-concrete structures. Hegger devoted himself to one of his core subjects: frame nodes and corbels. The third part of the event, in particular, offered many a highlight for precast concrete construction. Dr.-Ing. Enrico Tartsch from Halfen GmbH of Langenfeld, Germany, for example, presented the relatively new reinforcing steel bar anchor with forged anchor head, the HSC stud connector. This stud connector is especially suitable for connecting precast concrete parts with in-situ concrete structures, durably and with high precision. Because the product has now been on the market in various dimensions and designs since last year, he was able to demonstrate its successful application on numerous examples. The optimal and durable connection of structural concrete parts to each other also prompted many member companies of the VBBF to concern themselves, independently of each other, with the development of heavy-duty pins for shear transfer in building joints. Dipl.-Ing. 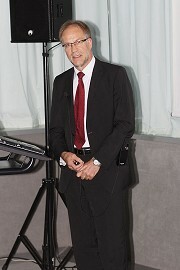 Werner Venter of Schöck Bauteile GmbH, in his lecture, not only presented the product of his company for this context, but compared it to the construction types of other manufacturers. Since he had also brought along samples of these products, which were passed on to all members of the audience of around 80, every participant could form his own opinion of the products from Halfen, Max Frank, Jordahl, and Schöck. All of the heavy-duty pins offer an effective solution for connecting precast concrete parts with in-situ-concrete constructions. One half of the hardware, either the pin or the sleeve, is integrated into the concrete component in the precast plant. In a second step the mating piece is placed on-site into a blockout in the loadbearing construction that takes up the precast component and is then permanently cast into the concrete. Although thermal concrete core activation currently always involves in-situ-concrete constructions, the Max Frank GmbH of Leiblfing, Germany, has developed a precast product that is an effective supplement. The precast component calls itself SORP 10 and involves an acoustically effective spacer for reinforcing the concrete floors that placed on the formwork bottom prior to casting. Concrete-core-activated floors, owing to the additional installation of the required hose register, are as a rule still in-situ constructions, but the SORP 10 itself is in fact a fiber-reinforced precast concrete component. The extruded U-profile is filled with acoustically effective expanded-glass granules that, once installed in the structure, are always oriented downward. This technique significantly reduces the very great reverberation times of the sound-reflecting, generally entirely fair-faced concrete floors, in situations required for concrete core activation.